While traveling solo used to be a fairly rare occurrence, it's a practice that's becoming increasingly common. Adventuring on your own gives you great opportunities for personal growth and introspection, especially when that trip takes place outdoors. That's one of the perks that makes solitary backpacking so appealing for many people. While this kind of trip can be a great opportunity to unwind and get away from it all, hiking on your own doesn't come without risks. If you aren't an experienced hiker, you should probably consider passing on the solo trip altogether. 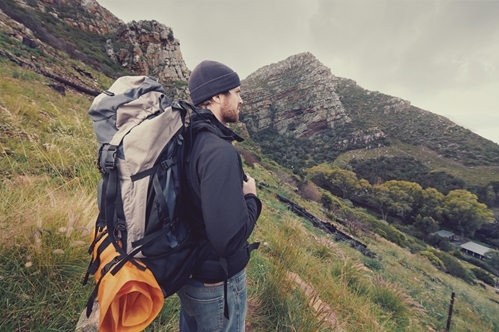 But if you're an outdoor enthusiast who's ready for the challenge of a solo backpacking trip, use this four-point checklist to ensure that your trip is as safe and successful as possible. When it comes to solo backpacking, all locations are not created equal. Ideally you should choose a destination that you're familiar with to lessen the risk of becoming lost or confused. Consider saving treacherous terrain for a trip with a buddy, and go for an easier region this time around. While you never want to get lost of break a bone during a backpacking trip, you especially want to avoid those risks when you aren't traveling with someone who can help you in the event of an emergency. According to the Huffington Post, someone should know where you are at all times when you're traveling by yourself. While it may be tempting to set out with no set itinerary and go where the wind takes you, it's not necessarily the wisest decision. By deciding on your route in advance, you can leave the information with a trusted friend or family member. That way if you don't return on time, search and rescue teams will know exactly where to look for you. You'll be glad that someone knows where you are if you're stuck in a ravine unable to move. Backpacker Gregg Hein spent six days in the mountains waiting to be rescued after breaking his leg on a solo trip, GRIND TV reported. Are there things that he would do different? Definitely. And most of those things have to do with packing the right equipment. For example, Hein reported that he should have packed a signaling mirror in his backpack. A signal mirror can be used to get the attention of helicopters and other rescuers far more effectively than waving a jacket or other object. Hein also stated that he wished he had brought a GPS transponder device. This piece of tech will save searchers valuable time in looking for you by pinpointing your location right away. When gathering your supplies, don't forget to bring a solar powered watch from Pro Trek. A model with a built-in watch compass will help you keep track of both your time and location without worrying about a dead battery. While you may have planned your solo backpacking trip for the sole purpose of getting away from normal life for awhile, it's best not to cut off communication altogether. If you're going to be gone more than a few days, schedule regular check-ins with someone back home. That way a friend or family member will be alerted sooner rather than later if something goes wrong. When it comes to surviving in the wilderness, every day counts, so if you're injured on the first day or two of your trip, you don't want to have to wait two weeks before anyone realizes you're in trouble. Hiking alone is scary for some who doesn't know if they brought the right equipment. Be worry free with the PRG300CM-4. It has a built-in altimeter, digital compass, barometer, thermometer, and it is solar powered. With the PRG300CM-4 on your wrist, you can finally enjoy the scenery.